When friends ask me what would be the ideal cruise line for them, my answer is mostly the same: Try it out! Of course I have a pretty good idea what suits my cruise needs best and those of my closest friends, but when it comes to cruising, the devil lies (as always) in the detail. And this is where it is most important to focus on when making a choice for a certain brand. In the past six years, I have cruised on many different brands and ships. From three star classic liners up to the shores of Iceland to mid-size luxury vessels along the Iberian Peninsula with flatrate Champagne and Butler service. I have paid numerous visits to ships of all kinds for my photography website Shipm8s.com and I have learned one very important lesson during all this: Every ship and every brand has a raison d´être. My priority in general is very, very simple: I want to escape to the ocean as many times as possible during the year. If I can take a cruise on a good deal while having a few days off at home, I´ll most likely do it. And this is where brands like MSC or Costa Cruises step in. Not that neither of them would be first choice for our annual leave, but they are fantastic when it comes to short or mini cruises in the Mediterranean or in Northern Europe at affordable prices. Something you can do perfectly over the weekend or in between. Getting from Genoa to Savona by train is cheap, fast and easy! Like this short getaway on Costa Mediterranea in November 2015. The last time I had met Mediterranea was in the port of Dubrovnik a little earlier that same year (click here for the photo gallery). She entered service in 2003 and belongs to the so-called Spirit class of the Carnival Corporation. With around 293 metres length and a capacity of approximately 2680 passengers, Mediterranea fits well in between the intimate Neo class and the larger Fortuna, Concordia and Diadema class-vessels. Homeport to the Costa Cruises´ fleet is the beautiful city of Savona in Northern Italy. Since I hate spending hours and hours on a bus (Costa offers transfers from most European cities to Savona), I prefer taking the plane into Genoa´s Cristoforo Colombo airport. From here you can ride the Volabus to Genoa´s main station Genoa Piazza Principe from where you can easily reach Savona in around one hour by train. I always plan for an overnight in Genoa though when cruising out of Savona. One of my favourite hotels is the Grand Hotel Savoia (read my last review here) which actually lies right across from the train station. After our arrival the night before and a good nights sleep, we took another cappuccino inside the train station before heading off. It was a marvelous and sunny day for November and quite mild. Luckily, we had packed light and warm clothes for the upcoming three days aboard Costa Mediterranea, so we were forearmed for whatever weather was waiting for us. The train ride to Savona was quite uneventful. Outside the station is the bus stop for the shuttle to the cruise terminal. The fare is 5 EUR per Person and must NOT be booked in advance (as stated on Costa Cruises´website). As Check-In with Costa normally does not start before 1:30/2 PM it is not necessary to arrive in Savona before noon. Walking from the train station to the cruise terminal to spare the fare for the bus or the 15 EUR for the taxi is, in my opinion, not very recommendable. As I had planned everything in advance, Check-In and boarding went by actually pretty smooth. So after our arrival at the terminal, we only had to wait for about half an hour until we could board Costa Mediterranea and enjoy a little lunch up in the Buffet Restaurant. Enough time to savour a fine Italian prossecco on the outside terrace in the sun. Since I have been cruising with Costa three times before, the extremely colorful and bright interiors were not so intimidating to me at first sight as they were to my partner, who was about to experience his first cruise with the Italian company. Admittedly, walking through a Costa ship is almost comparable to a visual rollercoaster, but if you try to see the ship as a whole composition, you may be able to accept this “Land of Milk and Honey”-design for what it aims to do: Carrying you off into another world. And this takes undenieably place. The rest of the afternoon passed by very quickly. After moving into our balcony stateroom with obstructed view on Deck 5, it was time for a little familiarization stroll through the ship. It is always funny how you can identifiy straight away your favourite spots on board! Besides our private enclave up on Deck 5 (and the view was not as obstructed as the term would imply), we very much fell in love with the outdoor promenade down on Deck 3 (you can actually almost completly circle around here) and the Aft deck of Lido Apollo (the rear swimming pool on Deck 9). So it came at no surprise, that after the Muster Drill we spent the sail-away with another glass of prossecco up on deck as Costa Mediterranea slowly maneuvered her way out of the port with Andrea Boccelli´s “Time to say Good-bye” roaring from the speakers. We finished the evening with a light dinner at the main restaurant Degli Argentieri and a night cap at the Salone Orientale, which proved as a great spot during the cruise if you are looking for a quiet location and intimate conversations. The first night aboard went by very smoothly. The bedding on Costa Mediterranea proved highly comfortable and since the arrival into Barcelona was not scheduled before noon, it was the perfect morning for Breakfast in Bed. “What could be more satisfying than standing at the reling with your morning coffee in your hands, a gentle breeze going through your hair and the sun rays tickeling your face”, I thought while I listened to the sound of the waves on this particularly beautiful day. It was grey and cold at home, that was for sure! As soon as Mediterranea had docked at the pier, we made our way through the ship to the exit. One thing that you will have to be well aware of when cruising on the mainline fleet of Costa is, that the ships stop in some ports for less than 6 hours! So it is always a good idea to have at least a thought of what you want to do before leaving the ship. Barcelona is a city that you can particularly discover very well on an individual tour. No matter how many ships are docked in port, there is a shuttle bus service operating from each terminal to Mirador de Colom, close to Drassanes Metro station, the Ramblas and the Gothic part of town. We have been to the city many, many times before, so this visit predominantly served as a Xmas shopping event. But if compatible with opening hours we would always highly recommend a visit to the most beautiful covered market Mercat St Josep La Boqueria for some seafood or Serrano ham and a glas of Spanish cava or wine. As exciting as Barcelona is, try not to exaggerate with the amount of places that you would like to see at once. This place means a lot to us! It bursts with history, amazing food and a lively atmosphere and is also just a stone´s throw away from Barcelona´s historic part of town with its wondeful little shops, cafés and restaurants. So after strolling for some time through the market, we spent the remaining hours with filling up our closets and shoe racks at home and finally making a stop to enjoy the local delicacy Tapas at Los Caracoles before returning to the ship. It is already dawning as we arrived back to the port. With acheing feet we climbed up to our cabin where we enjoyed a delicious ice-cold beer on our balcony while watching all the other cruise vessels passing under loud cheers before it was time to start enginges for Costa Mediterranea herself. Having enjoyed a marvelous day in one of Europe´s most exciting metropoles, we decided to finish the evening quietly. So after a brief dinner in the restaurant we payed visit to the theatre. And while the cast did (probably) their very best on singing and performing down there on the stage, I hate to say, but this experience has definitely been so far the least enjoyable from all the shows that we have seen during the years. No hard feelings though! We were here to enjoy a few days away from the winterly chills of November in Germany. And so far, this worked very, very well! 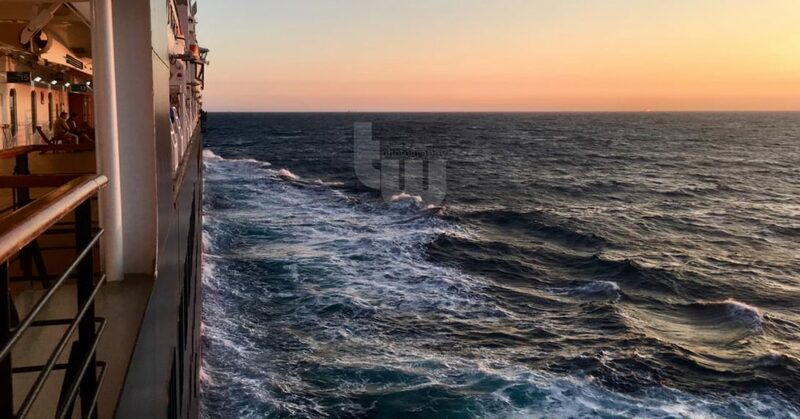 So after a last stroll over deck and a look onto the wash at the stern of the ship, it was once again time to be cradled to sleep by the gentle movement of Costa Mediterranea, slipping slowly and happily into dreamland. The next day anticipated us again with lots and lots of sunshine. Having ordered breakfast to the cabin (if you don´t like chaos and lines at the buffet, I strongly recommend you to do this EVERY morning when cruising on Costa) we took long time to finally wake up and decide on what we were going to do today. Decision was quite easy! After a decent workout at the gym, we settled down up on Deck 9 on a sun lounger to spend a relaxing day onboard. Apart from the sun, this day was accompanied by a quite nasty Mistral (very strong wind in the Marseille area). Being tugged in in our Winter coats and the woolen blankets that were handed out, it was still lovely to feel the warmth of the sun on the skin every time that the wind took a break in blowing. Enjoying a fantastic panorama onto the skyline of Marseille from the afterdeck while sipping on perfectly brewed Illy cappuccino was well worth it! Since this was to be not only a day to unwind and relax, but also the last day of our mini escape from winter, we had made a reservation over one of the interactive “totems” in the lobby for the ship´s speciality restaurant “Club Medusa” for the evening. The restaurant comes at a cover charge of 25 EUR per Person, but serves as a well done alternative to the basic offerings in the main dining room. Feasting on the made-to-order specialities and fine Italian wine, this was a fantastic conclusion to the last night aboard. I did have to return my cold Filet of Salmon, but was provided with a freshly prepared, hot one after a little while. Service was quick yet never pushy. As outstanding I would discribe the Berry parfait at the end. I am normally more of a Cheese person to conlcude a meal with. But if I had missed this sweet tooth, I would have missed out big-time! The next day, we cleared our cabin around 8 am and then took the shuttle bus to Savona train station. An hour later at Piazza Principe in Genoa, we stored our luggage inside the station at a price of 5 EUR per bagagge. It was a rather pricy yet great investion though! Our flight back to Munich did not leave before 4pm, so there was plenty of time for a little stroll around town and shopping. The station is about 20 to 30 minutes walking-distance from the aquarium and the beautiful old town. No fun with suitcases! So with our hands free, we could concentrate completely on a few hours in one of our favourite Italian cities. A last prossecco in an authentic Italian bar, a last promenade through romantic sidestreets, a last breath of that easy Mediterranean lifestyle. At least for now. A few hours later, as we leaned back on our seats and looked outside the plane´s window, watching the ocean slowly disappear underneath the clouds, I asked him for his resume being a Costa first-timer. “Loud and bright”, he said. “But decent.” And I agree. You´ll get what you pay for. And comparing to my recent experiences with the Costa brand, when you know what to expect on board, you will definitely come back. The prices are more than right, the quality of service delivered and the product itself are both very consistent across the fleet and straight forward. The only thing that I commonly dislike about Costa, MSC or any other brand offering these low-fare cruises is the crowd being attracted. But since you can always built your day around/away from your co-cruisers, who cares when the price is right? You should always keep this in mind when halting to book a certain cruise operator: Isn´t any day at sea when craving for Vitamin Sea better than staying home? And now that my better half has sucessfully passed his Costa christening and I officially have his permission, we will definitely sail on the Costa seas again. Happy cruising, folks! Remember: You will never have to, but if you keep your eyes open, you sometimes meet amazing people! This article is dedicated to Anne, Viveca, Eleanor, Vivian and Rob.